This document is addressed to people who want to develop Modality Components for Multimodal Applications distributed over a local network or "in the cloud". 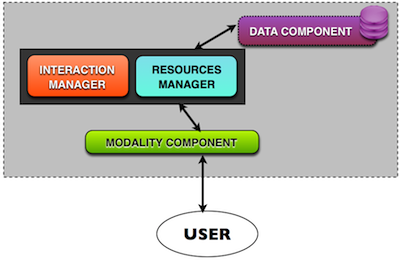 With this goal, in a multimodal system implemented according to the Multimodal Architecture Specification, over a network, to configure the technical conditions needed for the interaction, the system must discover and register its Modality Components in order to monitor and preserve the overall state of the distributed elements. Therefore, Modality Components can be composed with automation mechanisms in order to adapt the Application to the state of the surrounding environment. This draft was modified to enhance the contrast in graphics to meet WCAG requirements for color contrast. Fonts in Graphics were increased in size, a longdesc was added and the support for keyboard interaction. We modify the state diagram, update the normative part about states, edit the code examples and remove some informative text. To the best of our knowledge, there is no standardized way to build a web Application that can dynamically combine and control discovered components by querying a registry build based on the multimodal types of the modalities and their states. This document covers three needs on Discovery & Registration for this kind of web Application implemented following the Multimodal Architecture Specification. First, we define a new component responsible for the management of the state of a Multimodal System, extending the control layer already defined in the Multimodal Architecture Specification (Table 1 col. 1). This component will be responsible for handling the messages exchanged in order to declare the presence (or absence) of the Modality Components of the system . And finally, to allow the advertisement of the state of the Modality Components by using the adaptive mechanism, two new events are needed. (Table 1 col. 3) The semantics of these new events is not directly related to the interaction context but it is related with the system's configuration; for this reason a new component responsible for the management of the state of the Multimodal System is needed. 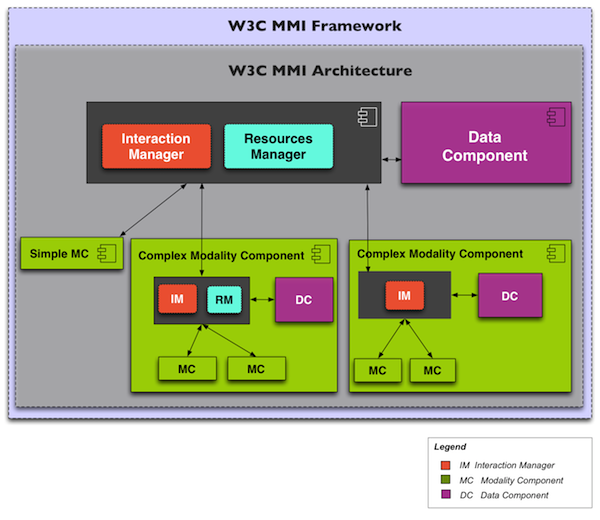 According with the MMI Architecture "a context represents a single extended interaction with zero or more users across one or more modality components. (...) In general, the 'context' should cover the longest period of interaction over which it would make sense for components to store information." Following the definition above and for the purposes of this document, an Interaction Context represents a single exchange between a system and one or multiple users across one or multiple interaction modes. It can be as simple as a single period of displaying an audiovisual content (e.g. a program), a phone call or a web session. For the purposes of this document, a Multimodal System is any system communicating with one or multiple users through different modalities such as voice, gesture, or handwriting in one or multiple interaction cycles, each one identified by an unique context. In a Multimodal System the Application or the end user can dynamically switch modalities in the same context of information exchange. This is a bi-directional system with combined inputs and outputs in multiple sensorial modes (e.g. visual, acoustic, haptic, olfactive, gustative) and modalities (e.g. voice, gesture, handwriting, biometrics capture, temperature sensing). For example, visual data can be expressed as a gesture modality (e.g. a pointing gesture) or as a signing modality (e.g. a deaf human talking). Following this idea, in this document a Modality Component is a logical entity that handles the input or output of different hardware Devices (e.g. camera, microphone, graphic tablet, keyboard, sensors) or software Services (e.g. motion detection, image recognition) associated with the Multimodal System. Modality Components are responsible for specific tasks, including handling inputs and outputs in various ways, such as speech, writing, video, etc. Modality Components are also loosely coupled software modules that may be either co-resident on a device or distributed across a network. For the purposes of this document, the term Application refers to a collection of events, components and resources which use server-side or client-side processing and the Multimodal Architecture Specification to provide sensory, cognitive and emotional information [See : Emotion Use Cases] through a rich multimodal user experience. The Application is a collection of interaction cycles designed to achieve one or mutliple tasks. For example, a multimodal Application can be implemented for use in an integrated way, mobile Devices and cell phones, home appliances, Internet of Things, objects, robots, television and home networks, enterprise applications, web applications, "smart" cars or medical devices. In this document we assume that push techniques allow the server to send new events or data to the client through progressive download or long-polling requests from the client. They enable client applications to subscribe to particular events, notifications or data streams and provide the server a callback address or a client-side service to which they are delivered. In consequence, to implement a push technique, the server must know the client's address in order to deliver the data, and some registry of registered subscribers must be created. The server determines when things change, and simply sends down the new data. In this way, new connections don't have to be opened all the time. In this document we assume that pull techniques allow the client to send new events or data to the server through events or long-polling requests from the client. For the purposes of this document, a Multimodal Session is a system's state in which is allowed or prepared the user interaction. It covers: the loading of components and ressources, its registration and its availability and the interaction cycle itself. A Modality Component may send a NewContextRequest to the Interaction Manager to request the creation of a new context of interaction. The interaction can be started by different Modality Components independently. Nevertheless, to start an interaction the Modality Component needs to be already part of the system a to be registered, given that a context represents a single extended interaction with one or more Modality Components. This means that the Multimodal System has two complementary phases: the runtime phase (defined by the execution of one or multiple interaction cycles), and the system configuration phase (defined by the loading of components and their monitoring and adaptation in real-time). The semantics of the NewContextRequest event is different and mostly oriented to the interaction phase, while the registering process is part of a previous phase, when even the presence of the user is not mandatory. This phase is designed for a system that will handle one or more interaction processes at the same time. The Extension and Status notifications are dedicated to the exchange of interaction data, while the data exchanged in a discovery process is mostly previous to any interaction between the user and the system. During the configuration phase (or reconfiguration according to a changement of the overall state), the system prepares and registers the information about the Modality Components (availability, technical characteristics, cost). In this way, all this information might be used in the future, when the user-system interaction actually takes place. The Resources Manager keeps the control of the multimodal session state (the state of the system to allow a series of user interactions) and the resources of the system in a unified layer with the control of the user interaction (Interaction Manager). In other words, the control layer (dark gray in Figure 2) encompasses the handling of the multimodal interaction and the management of the resources on the multimodal system. 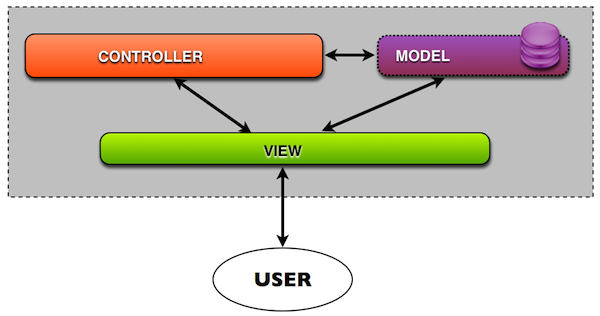 In this way, the architecture preserves its compliance with the MVC design pattern. As Figure 2 shows, the Resources Manager can be also be nested in a Complex Modality Component, following the Russian Doll Pattern. The Resources Manager described in the current document, allows the management of the states of the Modality Component (which represents the MVC view in the MMI Architecture) putting this function in the control layer (dark gray in Figure 4). 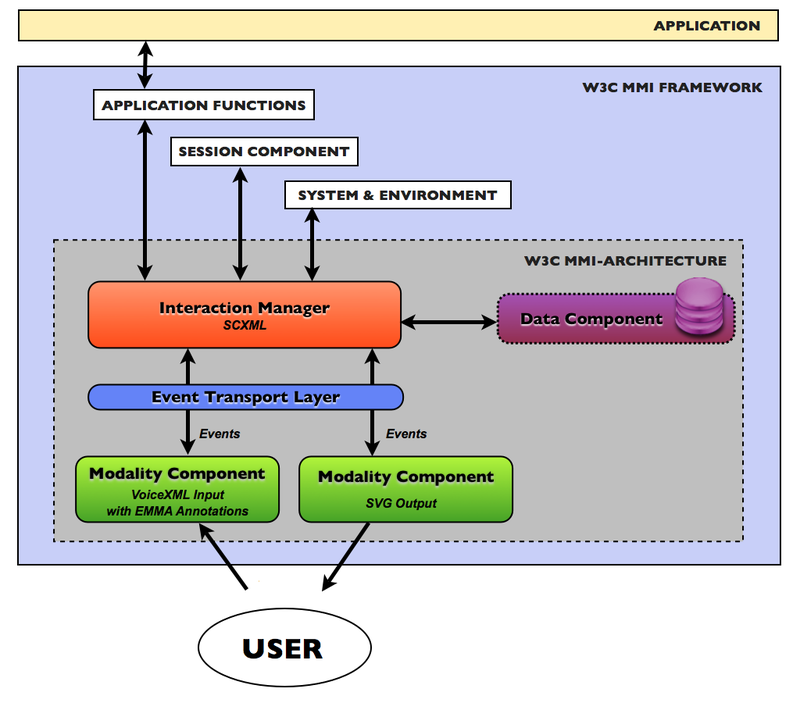 The Resources Manager translates the user's actions into method calls on the Data Component, as the MVC pattern proposes. WHile the INteraction Manager handles the user interaction, the Ressources Manager will take care of the state of the system, the type and avalaibility of the Modality Components and the state of the multimodal session. The Modality Component's communication and request of state information is restricted to exchanges with the Control layer as the MMI Recommendation defines. The Model broadcasts a notification to the Resources Manager (Figure 4), and then, the Resources Manager informs the Modality Component that the state has changed using a flow of messages through an UpdateNotification or a CheckUpdateResponse. Upon reception of the UpdateNotification or the checkUpdateResponse, the Modality Component updates the user interface according to the information received. The image of the current state, represented by the current situation and its state metadata. This image represents the current multimodal system configuration. Distribution The Resources Manager supports the coordination between distributed components, and their communication through the control layer. This enables it to synchronize the input constraints across modalities [MMI-I16] and also enhances the resolution of input conflicts from distributed modalities [MMI-I17]. Advertisement The Resources Manager is the starting point to declare and process the advertised announcements and to keep them up to date. Discovery The Resources Manager is also the core support for mediated and passive discovery and ilt can also be used to trigger active discovery using the push mechanism or to execute some of the tasks on fixed discovery. Registration The Resources Manager is also the interface that can be requested to register the Modality Component's information. It handles all the communication between the Modality Components and the registry handled by the Data Component, and it manages the multiple renderings of private and public data related to the state of the multimodal system or the state of the interaction cycle. Querying The flow of queries transit through the Resources Manager who dispatches the requests to the Data Component and notifies the Interaction Manager if needed. Some of these queries must be produced using the state handling events proposed on this document. 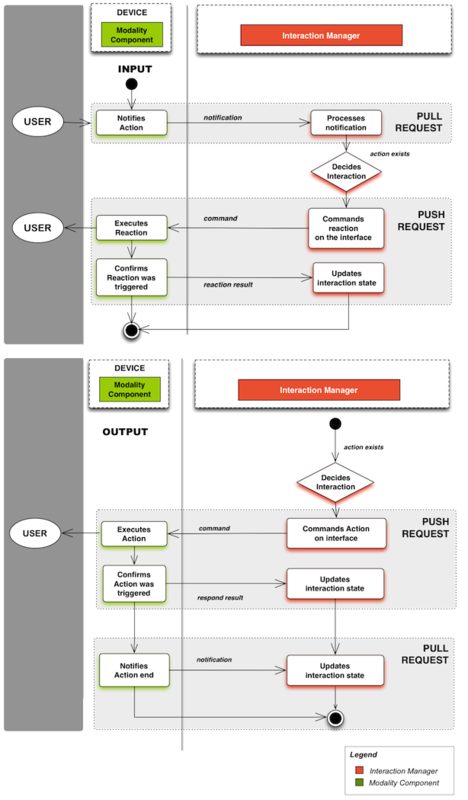 According to the current MMI life-cycle events protocol, the command of Modality Components is initiated by the Interaction Manager, which means that if there is an HTTP client-server implementation, it can be designed following a push notification technique. This document describes the flow of messages in both directions, which are needed for the Discovery & Registration of Modality Components. 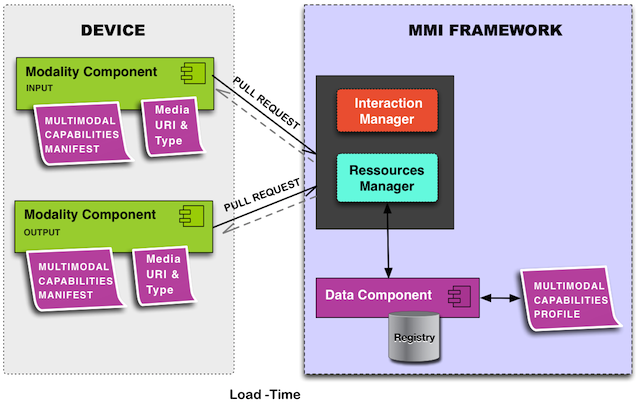 With this proposal, the MMI architecture will respond more accurately to architectural requirements like completeness, extensibility, integratability and interoperability concerning the relations allowed between requesters and providers of messages. Querying To enable information gathering in a multimodal system, the simplest strategy is to have all Modality Components providing a continuous stream of all the data that they gather to the Interaction Manager. However, for many types of applications where only a small subset of the collected information is likely to be useful, updated or pertinent, this simple approach can become very inefficient. For this reason, a tunable communication strategy offers significant advantages for optimizing querying. For this reason, a registration renewal mechanism is needed. We define a renewal mechanism based on the use of the timeout attribute and two new events: the CheckUpdate Event and the UpdateNotification, used in conjunction with an automatic process that ensures periodical requests. The communication intervals will be synchronized, because the Modality Component knows the exact publish interval beforehand according to a time pattern. In this way, data coherence is ensured and network performance maintained. Since the Resources Manager has access to all the state data, it can for example, use a prediction algorithm implemented in the Data Component, to foresee a time when the data is going to change. The Resources Manager then attaches this time value in the timeout triplet to the outgoing data allowing the data synchronization. The CheckUpdate events are the request/response pair, CheckUpdateRequest and CheckUpdateResponse. CheckUpdateRequest and CheckUpdateResponse are used to check if there	are any changes in the system. They share the Context, Source, Target, RequestID and Data fields with MMI Life Cycle Events. A CheckUpdate event MUST include Source, Target and RequestID. It MAY include a Data field. It MAY also include a Context field, if the event pertains to a specific context. An attribute that MUST indicate the type of check to be performed. Some values can be: Handshake, Monitoring, Reporting, DataCheck, Resuming, Leaving. This values are application specific. A Modality Component MUST be in Processing state when it is already registered and processing some task. The process could be any multimodal or unimodal task like transferring, searching, recognizing or any other kind of process. The processing state is related to a given multimodal session (the same Modality Component can handle multiple tasks in parallel from different users and sessions). A boolean-valued attribute indicating whether the state of the Modality Component will be automatically updated by UpdateNotification events or whether the Modality Component will keep sending UpdateNotification events in the future without waiting for another CheckUpdateRequest event. If the Resources Manager is temporarily unavailable the Modality Component will continue to send messages according with the last interval defined by the last timeout information received. An element with an attribute to link with external complementary metadata and an info attribute for inline data. The metadata non-functional information will be complementary to the data, which is a functional information type. This proposal is designed to support the annotation of Modality Components, to allow their discovery and registering in a multimodal system. The focus is the dynamic discovery of Modality Component as services using generic information about the underlying properties and types of processes. This information is provided by an announcement and a description (a capabilities manifest, for example) advertised in some network. In this document we will illustrate this point with an example of a multimodal greeting service in a smart environment. The Modality Components can be described with a document that evolves on complexity depending on the application needs. This description can be limited to indications about the Input and Output interfaces or be more detailed describing functional and non-functional properties, inspired by some of the Extensible Multimodal Annotation Markup Language (EMMA) properties [W3C-EMMA 2009] like emma:function, emma:media-type, emma:medium and emma:mode. The meaning of the terms for a controlled vocabulary in the form of a Glossary for the annotation of Modality Components, is divided in two parts (Figure 2): Subsumption terms and behavior terms. Based on this term, the Modality Component's capabilities can be classified from a high level perspective, for example, we can infer that the first component is part of the device class "TEXT_DISPLAYS", and the second to the class "MEDIA_CONTROLLERS". The triplet is inspired by the intentional name schema [ADJIE-1999] and show hierarchical tree relationships between general concepts (including some negative differentiating aspects). These names are intentional; they describe the intent of the Modaity Component and its implementation in the form of a tuple of attributes. The second term "Affiliation" is the high level Modality Component's category to adhere. It specifies the generic information about some complementary association at a high level. It puts forward an aspect of the Modality Component that could affect its selection and that is part of the advertisement policy of the service. This information can be parsed using generic tasks described my a manifest, a multimodal taxonomy or an ontology. It can be, for example, a complementary inheritance relationship or a relation based on some association or analogy. Some examples of affiliation can be ANIMATED_GRAPHICS or in the second, CONTROLLERS. Thus, this term can be used to represent some kind of inheritance or association with a more generic component class. The third term "Modalities" is a list of the supported modalities classified by medium. The media could be one of the EMMA properties (visual, acoustic, haptic) or could be a new one (like cognitive or biometric from a sensor input). It could be parsed using generic modalities described by a multimodal taxonomy or ontology available in the linked data web. It specifies the form in which some information is realized according to a precise medium. A modality is described by a situation and contains a recognizable logical structure: the information object. For example, a GESTURE modality is the visual realization and the haptic realization of some intention in a situation of communication (the information object is the «message» to communicate): a cross drawn in the air with a hand gesture, is perceived visually, and in some social contexts this expresses the benediction message. The fourth term "Functions" is a list of the supported high-level functions classified by medium. It is inspired on the emma:function property, but it can support a list of generic communicative functions that the Modality Component API can provide. In the example below the only possible functions are visual graphics, because is a face sinthesizer, but in other cases it can be multiple functions in different media. The functions are the technical entities supporting a limited number of modalities according to the semantics of the message and the capabilities of the support itself. A Modality Component acts as a complex set of functions. Each function uses one or more modalities that realizes some mode. For example, in Figure 2 the Avatar uses a 3D mesh modality through a visual mode. The functions term defines a list of functions using in the service, ordered by importance and by mode. For example, a gesture recognizer service uses the sign language function, using the single hand gesture modality that is executed in the haptic mode and is perceived in the visual mode. The Input specifies the triggers and data (or the general notion of a parameter) needed to execute the process. The description must list the MMI events that must be sent by the Interaction Manager as an input. The Output specifies the data transformation produced by the process. The description must list the MMI events that will be sent to the Interaction Manager as an output. 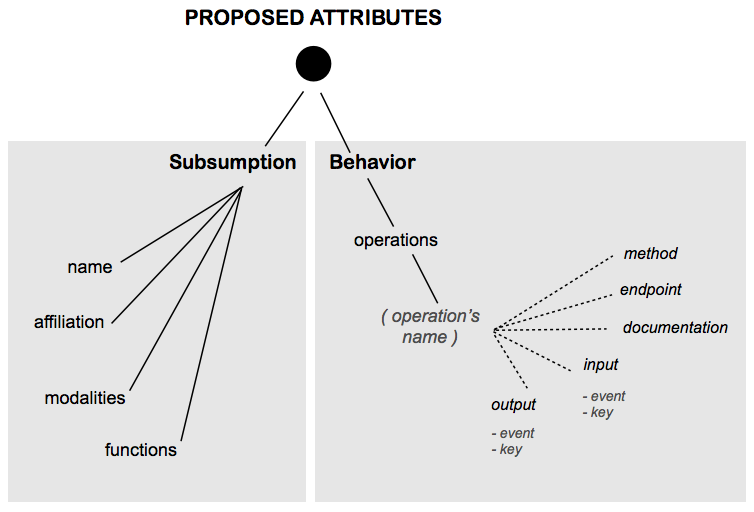 Input and output are used to transform the information, while preconditions and effects are related to the context of execution of a service, and the requirements and results in the "world' in which the service is executed. Preconditions specify a state of the context that must be true in order for the system to execute a multimodal service. Effects are the resulting states (atomic, sequential or concurrent) after a successful execution of the service or even in a case of failure. Preconditions and effects can be expressed in any rule (or logical) language. The language choice is application specific. In Figure 2 the "Face Synthesizer Service" acts in some mode that is perceived by a final user through a modality that is part of some functions, i.e. 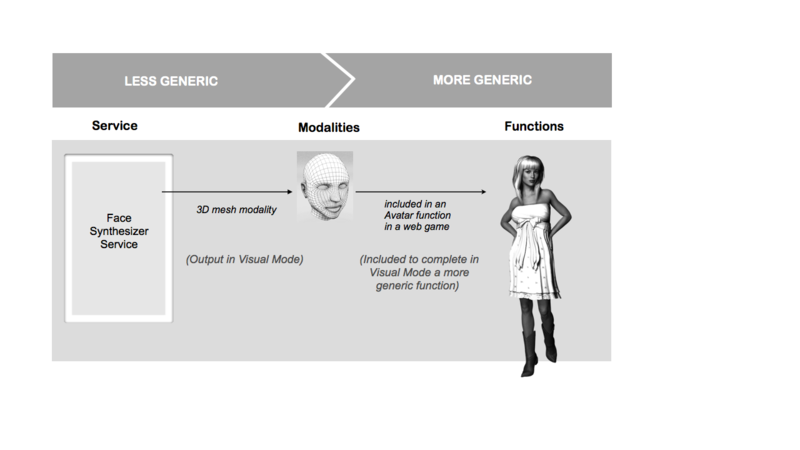 a face synthesis service acts in the visual mode that is perceived through a 3D mesh modality that is part of an avatar function. "documentation": "The user key to acces this API"
time and returns the acceleration info." The smile tag represents the operation that has been requested, the input tag express that this is a request, the event tag contains the MMI Lifecycle event to control the operation. There can be multiple MMI events inside the input and output elements to support concurrential or parallel commands to the interface. 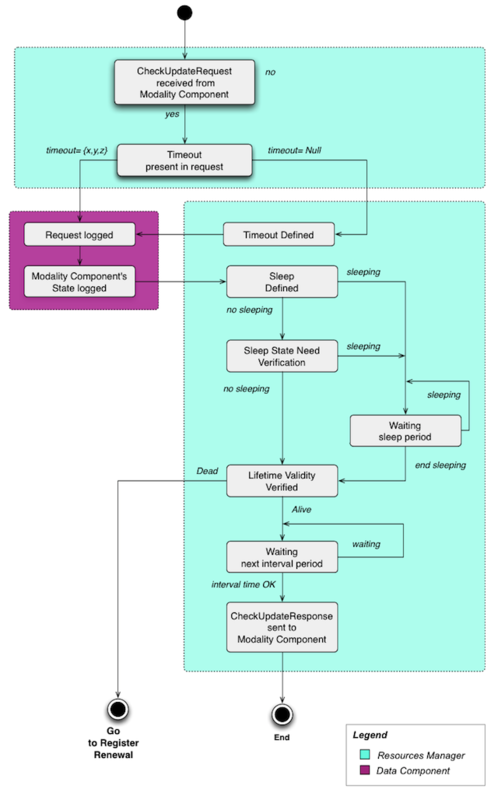 The MMI Lifecycle event sent to the operation provided by the Modality Component can be any of the events defined to handle inputs on the MMI specification. The authors wish to acknowledge the contributions by all the members of the Multimodal Interaction Working Group. Jim Barnett (Ed). Multimodal Architecture and Interfaces. 25 October 2012 W3C Recommendation. URL: http://www.w3.org/TR/mmi-arch/. ADJIE-WINOTO, W., SCHWARTZ,E., BALAKRISHNAN,H. and LILLEY,J. "The Design and Implementation of an Intentional Naming System". Proc. 17th ACM SOSP, Kiawah Island, SC. Dec. 1999.